In zoology, cricket is the common name for any of the grasshopper-like insects in the family Gryllidae of the orthopteran suborder Ensifera (long-horned grasshoppers), characterized by long antennae, strong hind legs adapted for jumping, and in many species males that make chirping sounds. Crickets provide values for the ecosystem and for humans. Ecologically, they are integral to various terrestrial food chains, consuming various plant material, fungi, other insects, and so forth and being consumed by such animals as mice, turtles, and birds. Some are consumed by humans as well, but they are particularly valued for the wonder they add to nature, such as with their nighttime singing, as well as being kept as pets in some areas (such as China). They have served as cultural symbols of everything from a sign of impending rain to financial good fortune to illness and death (Costa Neto 2006). Crickets are members of the insect order Orthoptera ("straight wings"), a widespread taxonomic group of generally large- or medium-sized insects with incomplete metamorphosis (hemimetabolism), chewing/biting mouthparts, and two pairs of wings, held overlapping the abdomen at rest. The forewings are narrower than the hind wings and hardened at the base, and the hind wings are membranous and held folded fan-like under the forewings when at rest. This order includes grasshoppers, crickets, katydids, and locusts. Members of the suborder Ensifera (crickets and katydids) are characterized by fine and threadlike antennae with well over 30 segments (except fossil representatives), stidulatory specializations of the forewings to make sounds, auditory organs (when present) linked via modified tracheae to the enlarged mesothoracic spiracles, tarsi with three to four segments, and a six-valved ovipositor when present (Gwynne and DeSutter 1996). The six-valved ovipositor is sword-like or "ensiform," thus providing the name for the suborder (Gwynne and DeSutter 1996). The suborder is divided into six superfamilies, 21 families, 1,900 genera, and 11,000 described species (Grzimek et al. 2004). The largest superfamily is Tettigonioidea (katydids or bush-crickets) with over 1,000 genera and 7,000 known species (Grzimek et al. 2004). Within this superfamily is the family Tettigoniidae, whose members are commonly known as bush crickets or katydids, and are closely related to the true crickets. The superfamily Grylloidea (which includes the true crickets and mole crickets) includes over 500 genera and 3,500 described species (Grzimek et al. 2004). Members of the family Gryllidae comprise the true crickets. They tend to be nocturnal and are often confused with grasshoppers because they have a similar body structure including jumping hind legs. Female crickets have a long needlelike egg-laying organ (ovipositor). The spermatophore in virtually all species of Ensifera is attached externally to the female's gonopore and has a single sperm reservoir in true crickets, unlike the double or partially divided sperm reservoir in most Tettigonioidea (Gwynne and DeSutter 1996). Crickets are omnivores and scavengers feeding on organic materials, as well as decaying plant material, fungi, and some seedling plants. 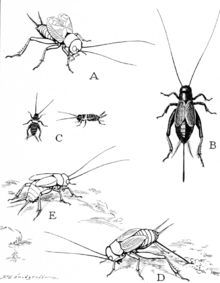 Crickets develop by incomplete metamorphosis, a process in which the larvae resembles the adults somewhat, as they have compound eyes, developed legs, and wing stubs visible on the outside, but the juvenile forms are smaller, lack fully developed reproductive organs, and, if the adult has wings, lack wings. In this mode of development, which involves gradual change, there are three distinct stages: the egg, nymph, and the adult stage, or imago. There is no pupal stage characteristic of complete metamorphosis. Through successive molts, the nymphs develop wing buds until their final molt into a mature adult with fully developed wings. Crickets are known for their chirp (which only male crickets can do; male wings have ridges or "teeth" that act like a "comb and file" instrument). The left forewing has a thick rib (a modified vein) that bears 50 to 300 "teeth" (Costa Neto 2006). The chirp is generated by raising their left forewing to a 45 degree angle and rubbing it against the upper hind edge of the right forewing, which has a thick scraper (Berenbaum 1995). This sound producing action is called "stridulation" and the song is species-specific. There are two types of cricket songs: a calling song and a courting song. The calling song attracts females and repels other males, and is fairly loud. The courting song is used when a female cricket is near, and is a very quiet song. Crickets chirp at different rates depending on their species and the temperature of their environment. Most species chirp at higher rates the higher the temperature is (approximately 60 chirps a minute at 13°C in one common species; each species has its own rate). The relationship between temperature and the rate of chirping is known as Dolbear's Law. In fact, according to this law, it is possible to calculate the temperature in Fahrenheit by adding 40 to the number of chirps produced in 15 seconds by the snowy tree cricket common in the United States. To hear the mating call of other crickets, a cricket has ears located on its knees, just below the joint of the front legs. In 1970, Dr. William H. Cade discovered that the parasitic tachinid fly Ormia ochracea is attracted to the song of the male cricket, and uses it to locate the male in order to deposit her larvae on him. It was the first example of a natural enemy that locates its host or prey using the mating signal. Since then, many species of crickets have been found to be carrying the same parasitic fly, or related species. Crickets are popular pets and are considered good luck in Asia, especially China where they are kept in cages (Carrera 1991). It is also common to have them as caged pets in some European countries, particularly in the Iberian Peninsula. Cricket fighting as a gambling or sports betting pastime also occurs, particularly in Macao. 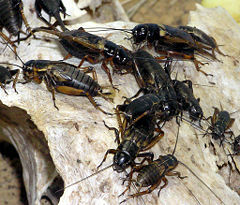 Crickets may also be eaten in some cultures, and are popular as live food for carnivorous pets. The folklore and mythology surrounding crickets is extensive (Costa Neto 2006). The singing of crickets in the folklore of Brazil and elsewhere is sometimes taken to be a sign of impending rain, or of a financial windfall. In Brazilian history, the sudden chirping of a cricket heralded the sighting of land for the crew of captain Álvar Núñez Cabeza de Vaca, just as their water supply had run out (Lenko and Papavero 1979). In Caraguatatuba, Brazil, a black cricket in a room is said to portend illness; a gray one, money; and a green one, hope (Lenko and Papavero 1979). In Alagoas state in Brazil, a cricket is said to announce death and thus it is killed if it chirps in a house (Araújo 1977). In the village of Capueiruçu, Bahia State, a constantly chirping cricket foretells pregnancy, but if it pauses, money is expected (K. L. G. Lima, unpublished data, cited in Costa Neto 2006). The mole cricket locally known as "paquinha," "jeguinho," "cachorrinho-d'água," or "cava-chão" (genera Scapteriscus and Neocurtilla, Gryllotalpidae) is said to predict rain when it digs into the ground (Fowler 1994). In Barbados, a loud cricket means money is coming in; hence, a cricket must not be killed or evicted if it chirps inside a house (Costa Neto 2006). However, another type of cricket that is less noisy forebodes illness or death. (Forde 1988) In Zambia, the Gryllotalpa africanus cricket is held to bring good fortune to anyone who sees it (Mbata 1999). In English-speaking comedy, the sound of crickets may be used to humorously indicate a dead silence when a response or activity is expected. For example, if a comedian in a TV show tells a bad joke, instead of the audience laughing, crickets may chirp. The Disney corporation has used a number of notable cricket characters in their animated movies through the ages. Most of these characters represent good. For example, in the movie Pinocchio, Jiminy Cricket is honored with the position of the title character's conscience. In Mulan, Cri-kee is carried in a cage as a symbol of luck, as in many Asian countries. Oecanthinae — tree crickets; usually green with broad, transparent wings; frequent trees and shrubs. Araujo, A. M. 1977. Medicina Rústica. São Paulo: Companhia Editora Nacional. Berenbaum, M. 1995. Bugs in the System: Insects and Their Impact on Human Affairs. Reading, Mass: Addison-Wesley. ISBN 0201624990. Carrera, M. 1991. Insetos, Lendas e História. Brasília, DF, Brasil: Thesaurus. ISBN 8570620233. Costa Neto, E. M. 2006. Cricket singing means rain": Semiotic meaning of insects in the district of Pedra Branca, Bahia State, northeastern Brazil. Anais da Academia Brasileira de Ciências 78(1). Retrieved December 1, 2007. Forde, G. A. 1988. Folk Beliefs of Barbados. Barbados: National Cultural Foundation. ISBN 9768076003. Fowler, H. 1994. Canibalismo entre insetos. Ciência Hoje 18: 15-16. Lenko, K. and N. Papavero. 1979. Insetos no Folclore. São Paulo: Conselho Estadual de Artes e Ciências Humanas. Mbata, K. J. 1999. Traditional uses of arthropods in Zambia: II. Medicinal and miscellaneous uses. The Food Insects Newsl 12: 1-7. This page was last modified on 2 April 2008, at 05:20.